Available Pyrus transcript data in GDR . Click on the Transcript Assembly name for more detailed information. The Pyrus Reference Transcriptome (Pyrus RefTrans v1.0) from published RNA-Seq and EST data is coming soon. The genus Pyrus comprises at least 28 species and 10 naturally occurring interspecific hybrids which are distributed in Europe, the mountains of north Africa, the Middle East, Western Asia and Eastern Asia. The species of major economic importance for fruit production are the Western European pear (Pyrus communis) and five Asian species or interspecific hybrids (P. pashia, P. pyrifolia, P. ussuriensis, P. ×bretschneideri, and P. ×sinkiangensis, which is a complex hybrid involving P. pyrifolia, P. xbretscheideri, P. armeniacifolia, and P. communis. Several species throughout the natural range are used as rootstocks, and P. calleryana, P. fauriei, and a clone of P. salicifolia are used as ornamentals. The genus is thought to have originated in the foothills of the Tian Shan Mountains in western China, with dispersal and speciation following the mountain chains both to the east and west. All species have no major incompatibility barriers to interspecific hybridization. The species are functionally diploid (x=17, 2n=34). Genome sizes of all species are not available, but the nuclear content of P. communis is 1.03 pg/2C. The genome size is approximately 577 Mbp per haploid nucleus, and that of P. xbretschnedieri is 527 Mbp. The number of genes is approximately 43,000. The genus is highly heterozygous due to self-incompatibility. Plants of the genus are trees or large shrubs and are deciduous except for the semi-evergreen P. kawakamii. Tree habit can be strongly upright to spreading. Cultivars are clones and are grafted or budded onto special rootstock seedlings or clones. The Occidental species have melting flesh and the Oriental species have crisp flesh. 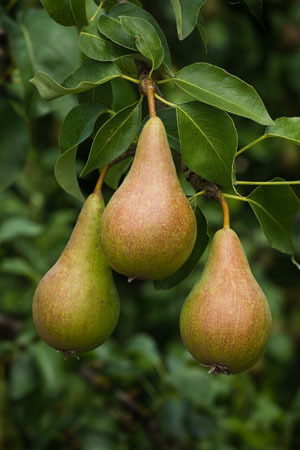 Pear fruit are consumed primarily as fresh fruit, but can also be canned, dried or pureed. High priority scion traits for breeding Asian and European species include fruit quality, productivity and precocity, and disease and insect resistance.